When people work with ontologies, XML schemas and software development, it’s almost a cliché to say that re-use of existing work is better than creating something new from scratch. Existing work, though, is not always a perfect fit to your needs, and the ease of customizing it for your needs often depends a lot on how the original work was designed—when you’re reusing XML schemas or software source code. Customizing OWL ontologies and RDF schemas, on the other hand, is pretty simple nearly all of the time, especially when you use TopBraid Composer. Create an empty new ontology and import SKOS into it. Define your two properties in this new ontology and give them a domain of skos:Concept so that SKOS tools such as TopBraid Enterprise Vocabulary Net(EVN) know that they’re potential properties of your SKOS concepts. To do this with TopBraid Composer, start by creating a new RDF/OWL file in one of your projects. On the wizard dialog box for creating this file, enter the Base URI of your new customized version of the SKOS ontology. If I worked for The Example Company, I might create a baseURI of http://example.com/ns/exskos. Once the file is created, having a namespace prefix associated with the base URI makes it easier to create the new properties, so on your new ontology’s Overview tab add an ex prefix for the http://example.com/ns/exskos# namespace. Don’t forget the pound sign; the prefix will be standing in for this URI, and you wantex:editor to represent http://example.com/ns/exskos#editor, not http://example.com/ns/exskoseditor. Now we’re ready to add the customizations. Instead of creating a new editor property from scratch, it’s better to define it as a subproperty of the Dublin Core dc:creator property so that applications that don’t know about our new property but do know about Dublin Core properties will have some clue what it’s for. Drag the dc1-1.rdf Dublin Core ontology file from the /TopBraid/Common folder in TopBraid Composer’s Navigator view to the Imports tab to import the Dublin Core ontology. You’ll see several new properties will join the SKOS ones on the Properties view. Right-click on dc:creator there and pick Create subproperty. In the Create subproperty wizard, replace the dc:Property_1 value that appears as the default Name of new instance value with ex:editor, which uses the ex prefix that you defined earlier. To show that your ontology is defining this new property for SKOS concepts, click the small white triangle next to the word domain on the ex:editor property form and pick Add existing to indicate that this property’s domain will be an existing class. Click skos:Concept, which will be under owl:Thing on the wizard’s class tree, and click OK.
Click the Properties view’s small white triangle to display its menu and pick Create rdf:Property. 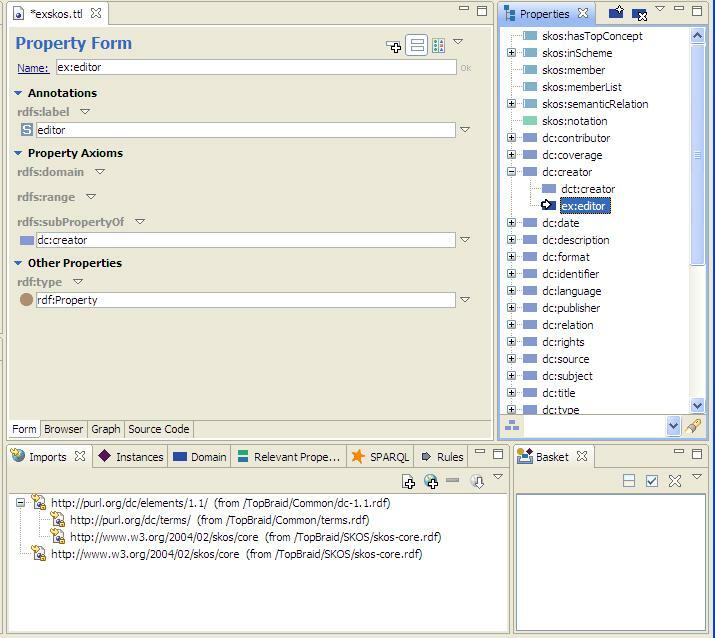 Name the new property ex:deptCode on the Create Property wizard dialog box. The Annotations Template’s rdfs:label checkbox should already be checked, so click OK.
Set your newest property’s domain to skos:Concept the same way you did for ex:editor and save your file. You’re done! You know have a customized version of the SKOS ontology. If you now use TopBraid Composer or EVN to create a new instance of the Concept class in this file, you would see editor and dept code fields on your new concept’s resource form along with has broader and all the other standard SKOS properties. (If you create concept instances with TopBraid Composer and the labels are toggled to show qnames instead of human-readable labels, they’ll say ex:editor andex:deptCode.) Instead of creating concept instances in this file, though, you would more likely create a new taxonomy file that imports your customized ontology the same way that your ontology imported the SKOS and Dublin Core ontologies, and then you would store your taxonomy’s concepts in this new file. The modularity of this approach brings another benefit that isn’t as easy when customizing typical XML schemas and other software resource files: when a SKOS upgrade is released, you can simply delete the import of the current SKOS ontology in your customization of it and import the new one instead, and all of your applications that use your custom ontology should be able to go on using it the same way the did before. It’s nice to know that customization of a standard ontology that nearly meets your needs is so easy, and many organizations are doing this with the SKOS ontology to create a better fit with their vocabulary management requirements. This isn’t limited to customizing SKOS, though; the same principle works with any OWL ontology or RDF schema. As an added benefit, if you create a customized version of a particular standard for your enterprise, you can follow these same steps to create customizations of your customization for individual departments within your enterprise.